Jake Thurston likes working with both hand tools and sophisticated equipment in his work in the optics field. He has always liked to design and innovate. He took programs at Monroe Community College that gave him the right skills for a job as an optician, but he thinks people with a variety of job skills in applied sciences, technology or the trades can be good candidates for the optics sector. He works at Optimax as an optician. 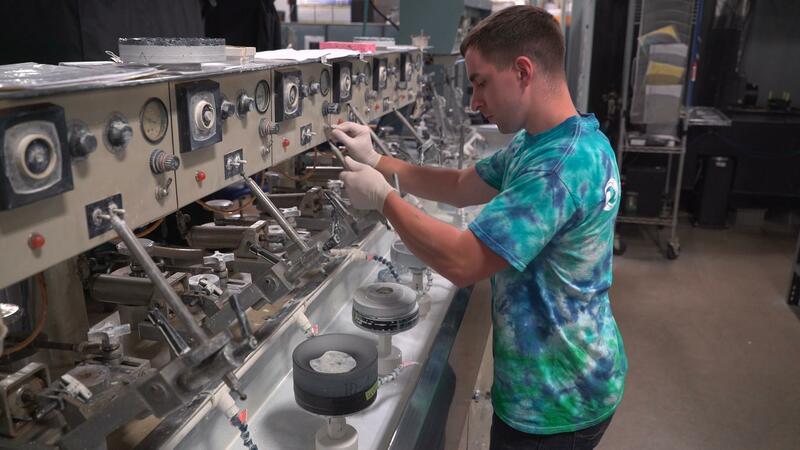 An apprenticeship in precision optics manufacturing can lead to higher education paid for by your employer.Travis Montgomery started working part time at Optimax while going to a BOCES program in high school. He didn't plan on going to college, but when Optimax had a program that would pay for his higher education degree, he decided to take advantage of working and going to school full-time. He is an apprentice in the precision optics manufacturing sector. Finding a career you love that let's you learn new skills on the job as a maker was what drew Genny Kingsley to optician training.Genny Kingsley tried a variety of jobs out of high school after getting an art degree. Nothing felt right until she started her optician training at Optimax. She takes joy in being a maker and continuing to learn new things. She has options for apprenticeship, on the job training and higher education. She advises that someone could do well in her job out of high school with on the job training to further her career. She loves being creative and the hands-on nature of making products that have value.